Ruinart and Ron Arad have unveiled the fruit of their artistic collaboration: the designer created an elegant cooler for the prestigious Ruinart Blanc de Blancs to chill the bottle at the perfect temperature for enjoyment. 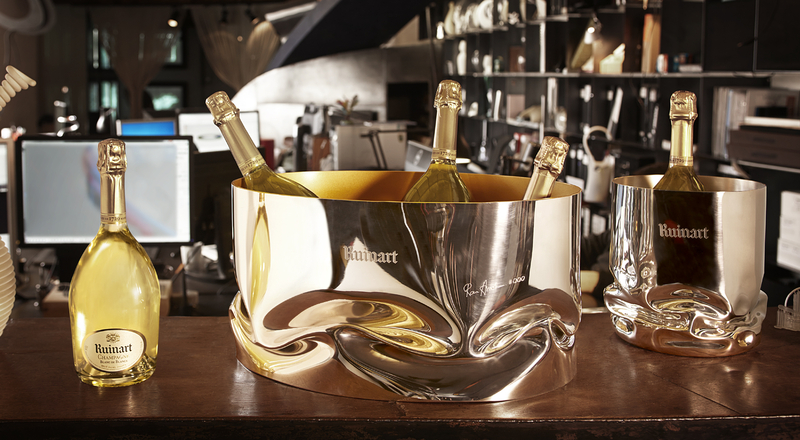 Ron Arad has focused his mastery of curves and metalwork on a sleekly aesthetic bottle cooler for Ruinart. The object expresses the free spirit that characterizes all his designs. The designer’s colorful creations include the iconic Rover armchair and the Well-Tempered chair. For Ruinart, he once again went beyond limits to create a unique, sculpture piece with dancing forms. Delicately compressed with a single fold, the curved basin was produced by Orfèvrerie d’Anjou, a 300-year old family-owned firm whose remarkable craftsmanship made the designer’s idea a reality. Elegant and supple, the solid tin material proved ideal to create a play of brilliant reflections. The cooler is sold with a magnum of Ruinart in a trunk with the House’s coat of arms, in a numbered limited edition of just five pieces signed by the artist.